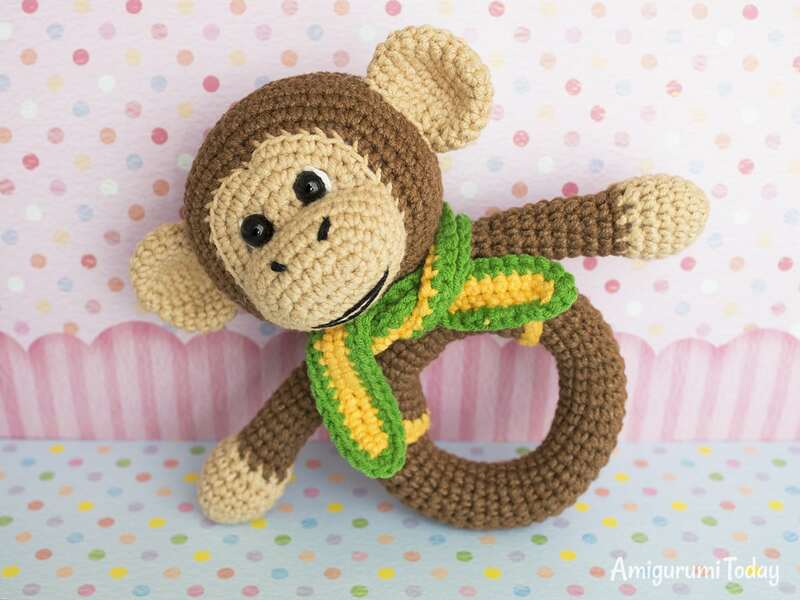 This crochet monkey rattle is sure to become one of baby’s favorites! 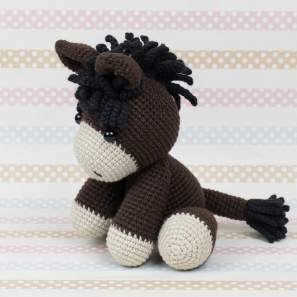 It provides a wonderful way to help develop baby’s motor skills. 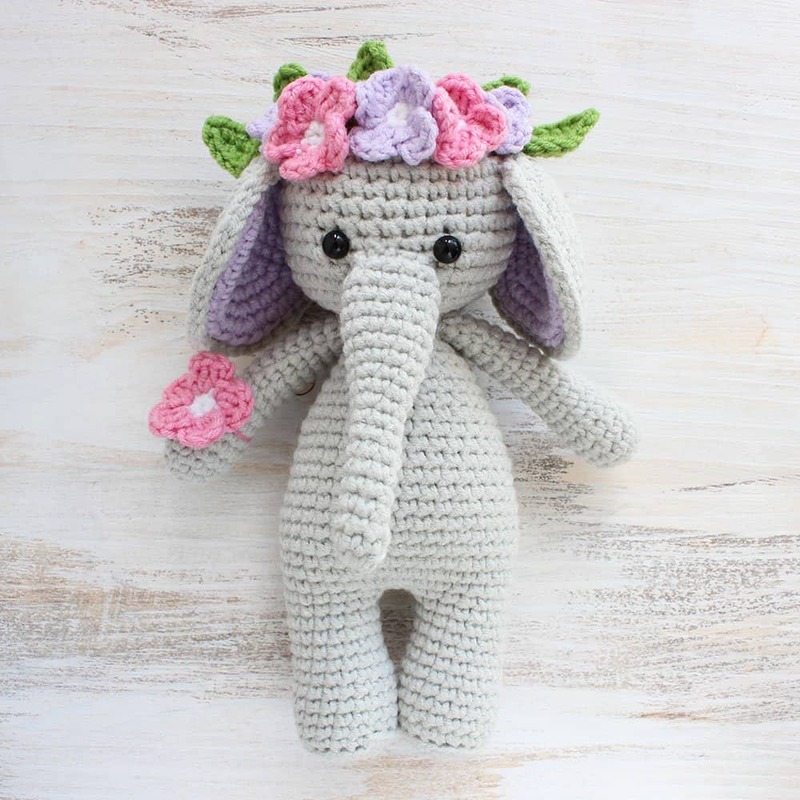 One important note before you start following this crochet pattern – toys with small plastic parts should not be given to children under the age of 3! We strongly recommend embroidering eyes instead of using plastic eyes. Better safe than sorry! 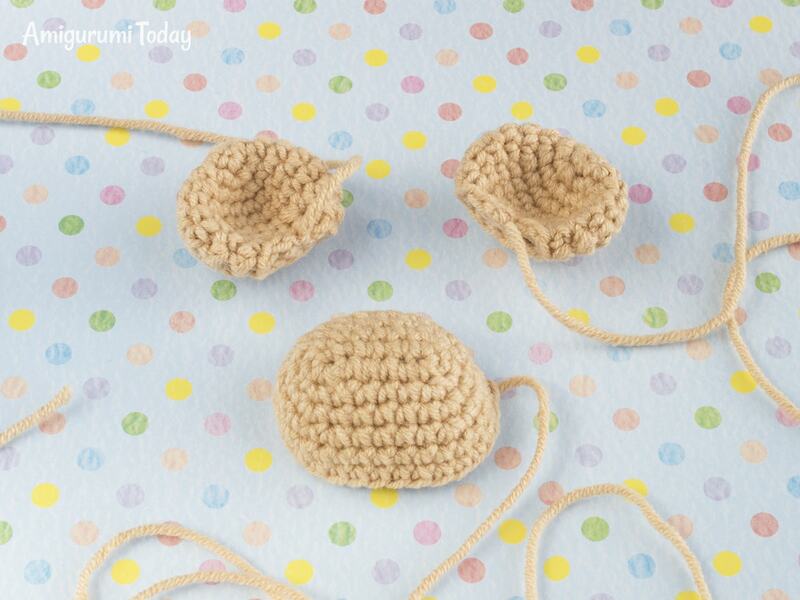 The size of finished crochet rattle is about 12-13 cm (5″). 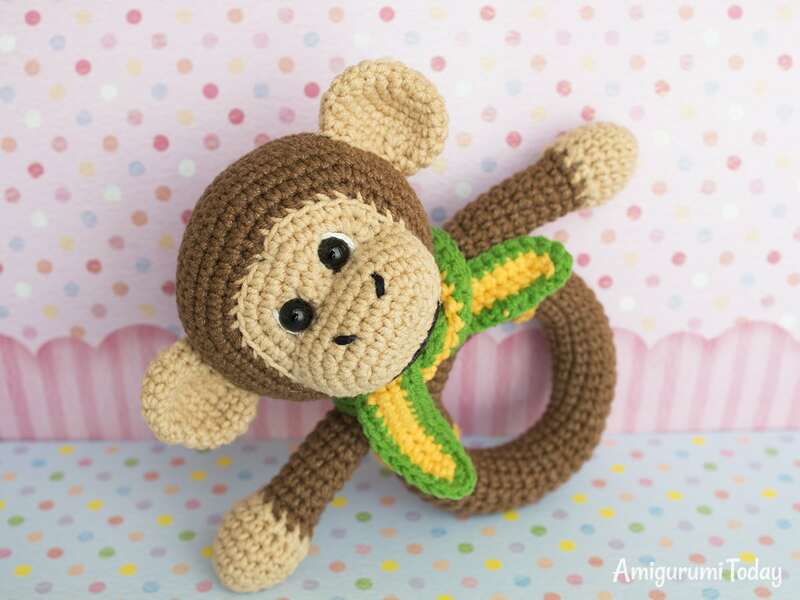 This crochet pattern describes the rattle without a wooden ring. 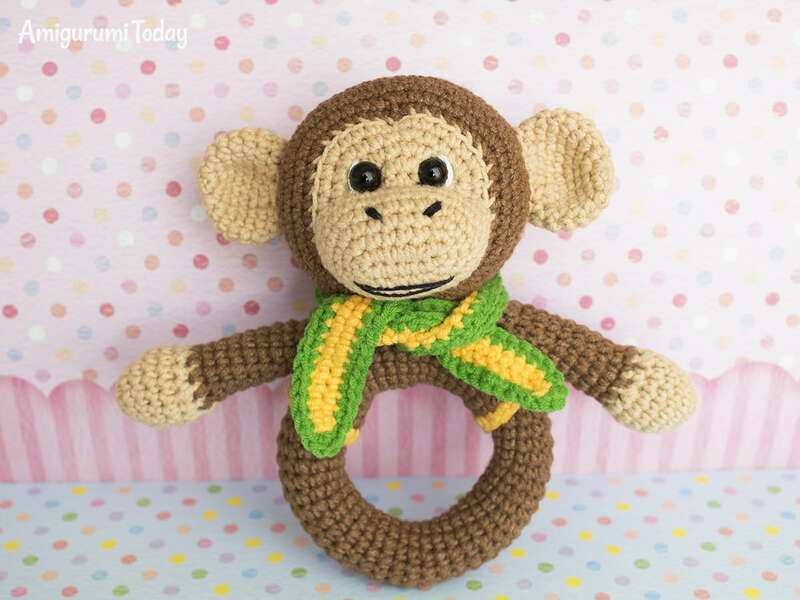 If you want to use a wooden ring, crochet the base rattle parts (ring and semi-ring) around it, beginning with the ring and finishing with the semi-ring. 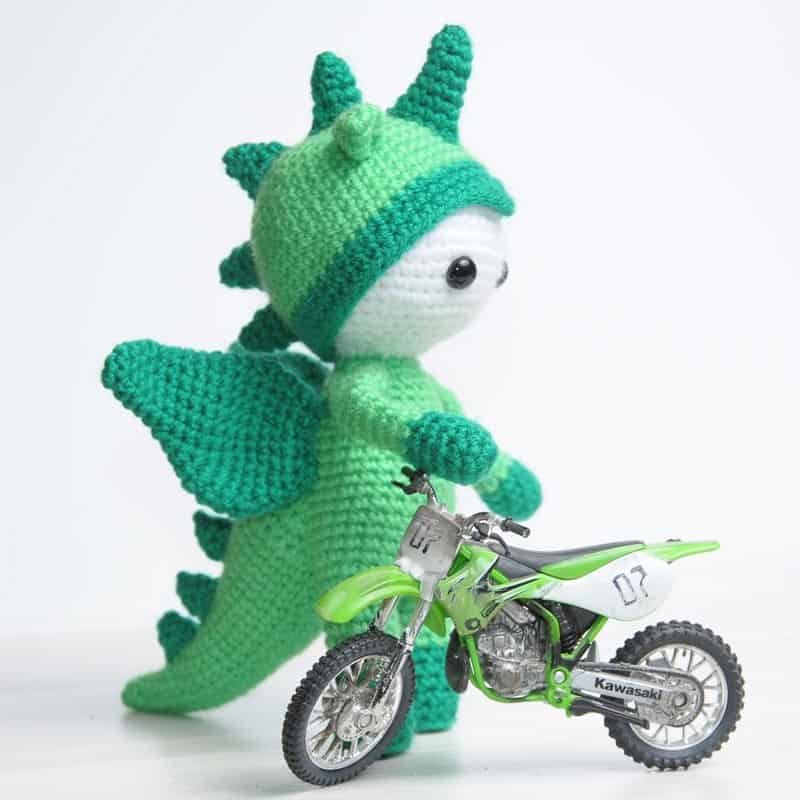 Crochet 15 ch and join with sl st to make a circle. 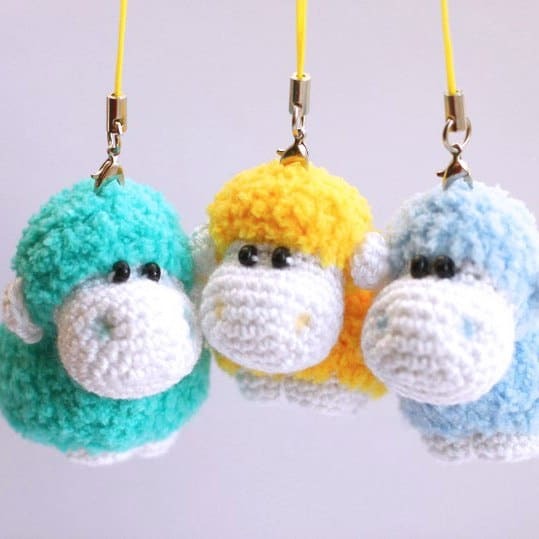 Start each round with 1 ch and finish with sl st. Continue crocheting around about 18 rounds. Crochet sc along the edges of the semi-ring with yellow yarn. Fasten off and weave in the ends. 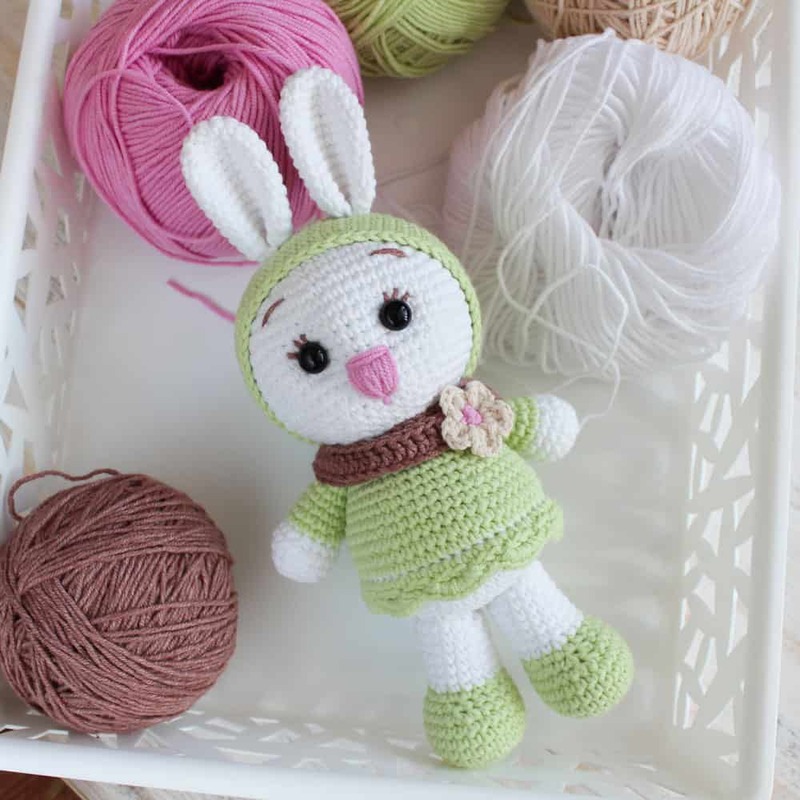 Crochet 12 ch and join with sl st to make a circle. Continue crocheting around in spiral about 45-46 rounds. Now you have a cylinder. Insert it in the semi-ring, then join the ends of the cylinder with sewing needle to form a ring (don’t forget to stuff with fiberfill). Fasten off and weave in the end. Hide the seam shifting the semi-ring. 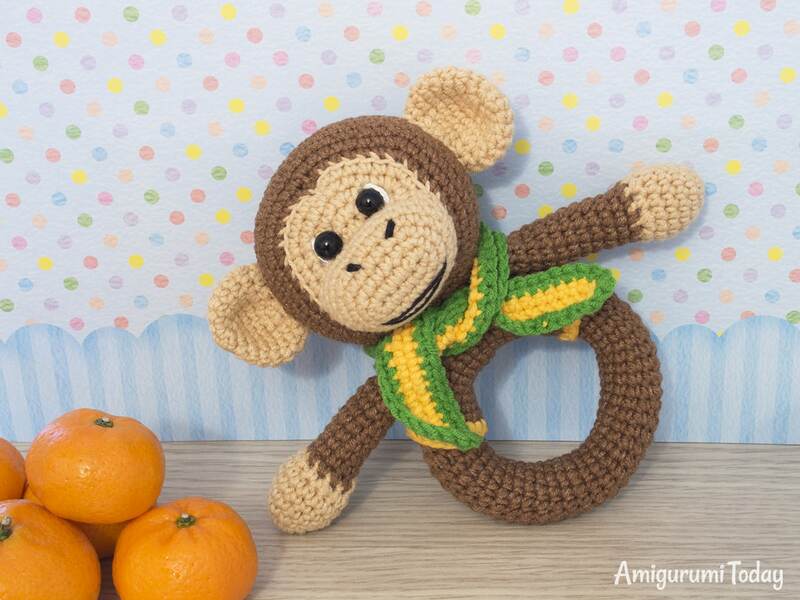 Start crocheting with beige yarn. Close the hole. Fasten off leaving a tail for sewing. 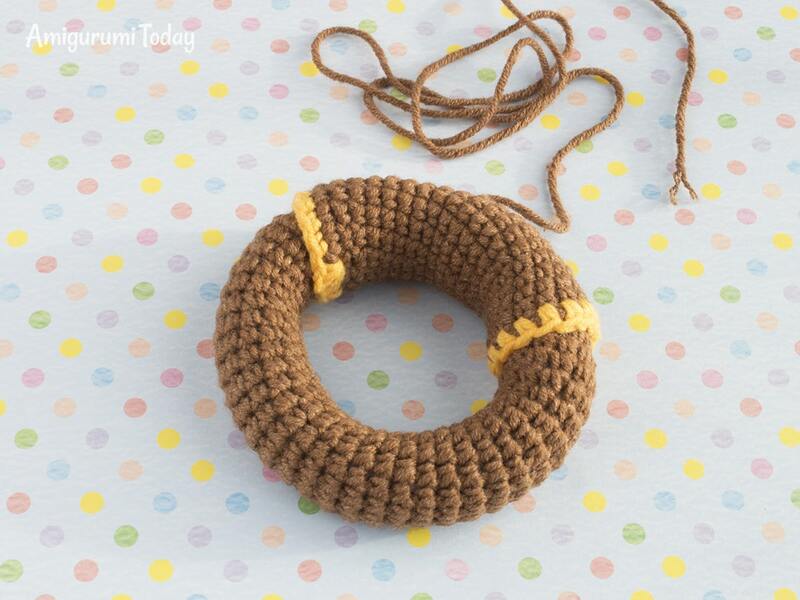 Crochet in continuous rounds with beige yarn. 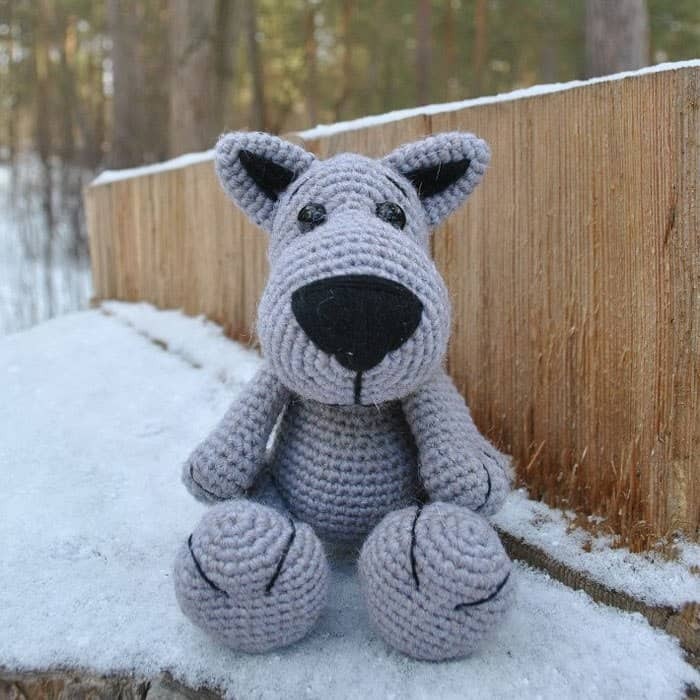 Crochet 7 ch with beige yarn. Continue working in spiral around foundation chain starting from the 2nd ch from hook. If you use safety eyes, insert them between Rnd 3 and Rnd 4 (about 4 stitches between the eyes). Embroider eye whites with white floss. Put small beads inside the plastic container. Close the container and secure it with cloth sticking tape. 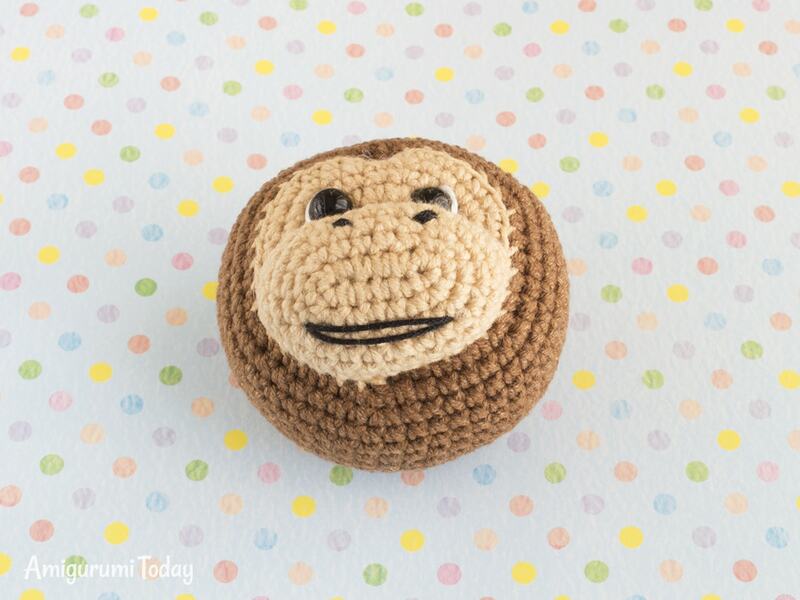 Insert the container with beads inside the monkey head and stuff the head with fiberfill. Rnd 3: crochet sc in each st around the scarf making 3 sc in the stitches at both ends of the scarf. Fasten off and weave in the ends. 1. Sew the muzzle to the head right under the eyes. 2. Embroider nostrils and a mouth. 3. Make indent on the head top (on the beige circle). 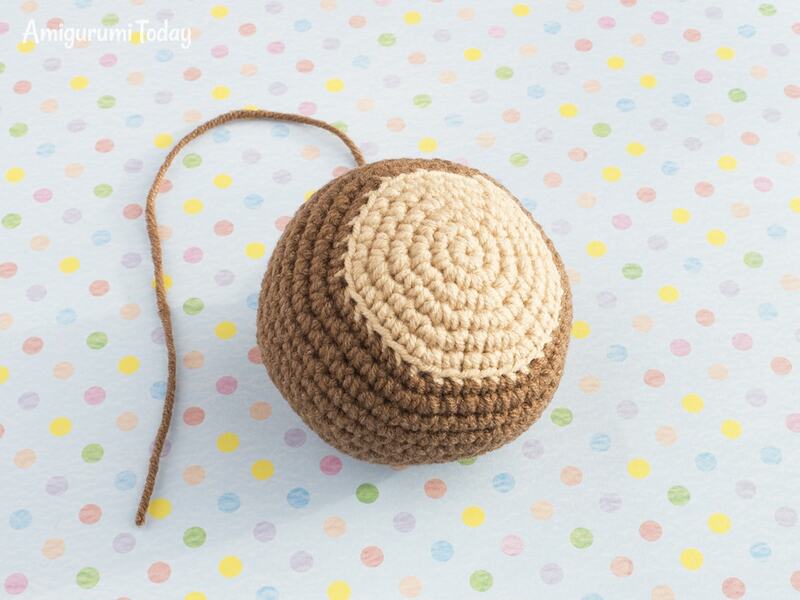 Insert sewing needle with beige thread in the middle of the bottom of the beige circle and bring it out on top of the beige circle, grab a couple of stitches of Rnd 6 of the head and come back to the place where you started, pulling down the top of the beige circle slightly. Fasten off and hide the thread end. You can also make small eye indents, if you wish. 4. Pin the ears to the head and sew them on. 5. Sew the head in the middle of the semi-ring. 6. Sew arms to the ring near the head. 7. Put on the scarf. Muchas gracias por compartir tus trabajos eres una artista. 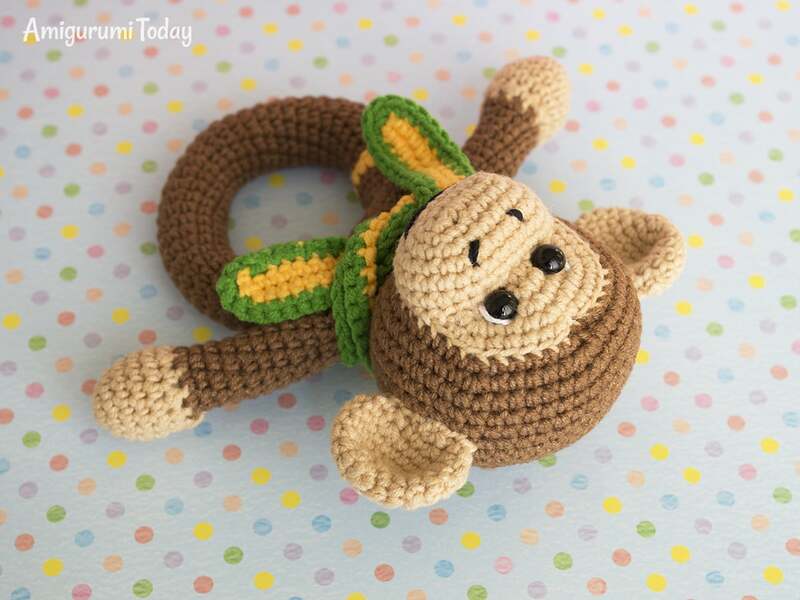 Monkey ring extremely cute! Thks for sharing!